The thoughts started to come as I lay on my bed, the light fading away from the day to become night once more. I drifted in and out of sleep as the darkness covered me like a blanket, everything silent except for the playlist of Trent Reznor music I had in the background. I despise the logic of the poster this girl holds up. I despise it for a number of reasons but the main reason I despise it is for a crucial piece of logic its missing. 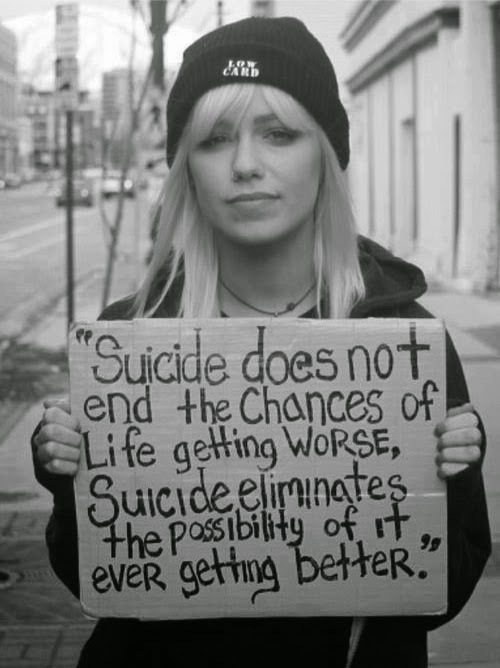 Let's for a moment skip over the error that "suicide does not end the chances of life getting worse" (it does, because there is then no life to get worse!) and move on to the second half of the poster. It is said here that if you kill yourself that your life will never get any better. Well, true enough as far as it goes. But YOU WILL BE DEAD. And dead people don't have to worry about trivialities like "better" or "worse" at all. They are DEAD. So the poster enunciates a living person's perspective and not a dead person's. Worse, it gives a particular living person's view and not a universal one. Usually when I see that someone has tweeted this again I feel a flush of anger that once more someone is tweeting illogical banalities, trying to lock people into the prison of a life they don't share in a world in which some don't even want you to know that by taking some very simple steps you could have escaped from existence, forever, in very short order. What are they scared of? Some people's lives are unutterably bad and I would doubt their sanity if they DIDN'T want to escape them. Now I don't really mean to go on about suicide. As I've already suggested, the subject makes a lot of people antsy and nervous - most often for reasons they can't even describe. But I needed to report the thoughts that just came to me unbidden as I lay in the silence of my room. I really do enjoy silence. It is very spiritual and very cleansing to the soul. It strips away all the effluvia of life that attaches to you when you chat and interact with others and get the grime of life onto you. Life is not a nice thing. You collect things that you need to periodically wash off just like the dirt that causes you to shower or bathe. I recommend sitting, lying or even walking in silence (and preferably darkness) to anyone. As I lay on my bed my thoughts broadened from this initial thought to thinking about life itself. Now I don't claim my thoughts about life are mainstream. I don't claim they are moral. To be honest with you I could really care less about being either of those things. But, as with my music, I would try and claim that my thoughts are honest - in the sense that I have given time to them and they are as accurate a description and summary of them as I can give at this time. Maybe that counts for something and maybe it doesn't. I know I'm not the only person who thinks but there seem to be a lot of people who don't. So here goes. The thought often occurs to me (every day) "What if life is the prison and death is the escape?" I wonder who of my readers can even appreciate that as a genuine question that makes their mind do real work thinking about it. But that's a real, genuine and live question for me. If it was put to me as a proposition I wouldn't have too much trouble accepting it as true. Because life can seem like a prison to many people. For much of my life it has. If there were a mythical button you could press which took your life back to point zero, the point of your conception, and, instead of living your life, you never existed instead, I could and likely would press that button. I can, hand on heart, honestly say that there hasn't been a day in my life, now stretching over 46 years, when I have felt that life was worth living. Not a single day. Of course, like others I have good days and bad. But that's not the point. The point is is there anything that would make a human life worthwhile? Can life mean anything if it ends? Of course, there are consequences of accepting this premise. Crime and punishment, for one thing, is radically re-envisioned. Death, on this view, is seen as an escape from any punishment (which is why the death penalty makes no sense. You are essentially freeing the criminal from the burden of life). Any crime you can commit you eventually get away with. Human beings are mortal, they all die. They all escape in the end. At the point of death it matters not if you lived 70 years "free" (human freedom is a whole other discussion!) or 70 years incarcerated. Every punishment has a terminal limit: the length of your life. I think this is why religionists and people who talk in spiritual terms try to change the game and extend the narrative. They want to be moral. They want to believe that bad things do get punished and there is justice. But, I'm sorry to say, I just don't consider myself that naive. And, trust me, I am naive in a great many ways about a great many things. I even wrote a song about my naivety once. But not on this. There is, ultimately, no justice. Morality is just the power to impose your views on others. For where there is no power there is no morality - whether that's an invisible being or a Govt with arms and a legal system. I think a lot of the genuinely bad people in the world know this. I think many of them are a lot more realistic about life than the white knights and the angels on the side of good who maintain the pretense of a fantasy world of justice and good just to get them through the day. It was a radical moment for me when I started to think about life in cosmological terms. We are like ants on a really small and insignificant planet that is placed nowhere special in the universe. There are billions of galaxies just in our bit of the universe. On one theory there may even be billions of universes, a multiverse, in which every possible version of you is living every possible life you could live. But you are stuck, in the meantime, with the life that only you can live because you are stuck being you. Even if this life of yours lasts as long as a human has ever lived (around 120 years I think) that's just an eye blink of time, a finger snap. Its nothing. Its inconsequential to anything. The universe will literally not notice that you ever lived and your impact against the huge background of all that is will be as good as nothing. I don't say all that in any nihilistic sense although I do believe that most things human beings put their faith in are merely egotistical devices for their survival. I say that because I think its actually true and it is in some sense liberating to come to some conclusions about things like that. Ever since I've thought that we are all as meaningless and inconsequential as we think ants are, or microbes or amoeba or bits of dust, I've felt somewhat liberated. The idea that everyone escapes from life because we all die I find liberating too. Nietzsche, a great intellectual inspiration for me, was a man who suffered with many physical ailments over a number of years. He writes in one passage that the thought of suicide brings him safely through many a night. This is because the thought that life might go on forever is actually not a terribly appetising one. Imagine living the life you live forever. It goes on and on and never stops even as you age. I don't know about you, but actually I hate that idea. For me, the knowledge that I actually won't exist for very long and that I will NOT exist forever is a whole lot better. In fact, knowing that I will die is, paradoxically, what has kept me alive until now. I'm not ashamed to say that I have personally struggled more than once with the idea of suicide. I'm alive because I know that whatever I suffer won't last. Because it can't. We live in a physical universe and in a physical universe everything changes and all things degrade and pass away. I just finished writing a set of musical pieces about what it means to be a human being. Maybe you have heard some of them. I literally think about what it means to be human, to be alive and associated things, every day. Seeing pictures people post online of the sea or mountains or animals makes me wonder. Its like the purpose of my largely empty life is to ponder on what life is for. The answer might be that its not for anything. Life just is. A chaotic and insensible universe, the expression of no will but just of random events, gave birth to thinking animals from its own illogic. Those animals can think and reason and they turn that reason on themselves but it drives them mad and makes no sense and they realise that there often aren't any reasons or any logic to things. And that makes sense on one level. Logic is human and only of use to humans. The universe doesn't have to be logical. It is unlogical. But this drops a huge turd in the thinking of human beings who need logic to function. Their egos need to capture and control the information and sense data that they receive so they can make use of it. Humans need order but the universe is not ordered. It dawns on them that, actually, life, the universe and everything is not about them at all. They are just by-products, peripheral, inconsequential.